openSUSE took part of the OpenRheinRuhr like every year. This year we were sponsor and I was the organisator of that and the booth. 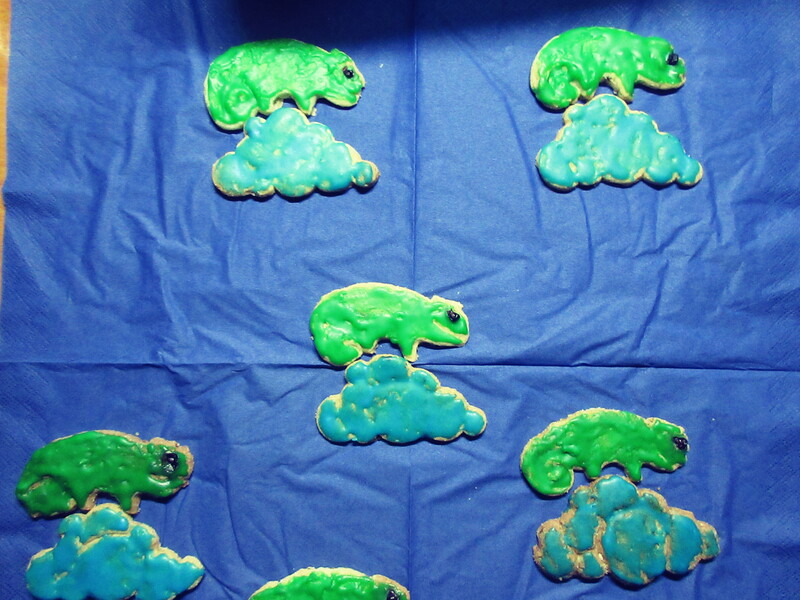 Additional to that I gave a presentation about the new release of openSUSE Leap 42.2. It was full and many people were interested for the news in the community. I do that yearly and openSUSE talks are standard there since 3 years. Many people are saying that I am not allowed to be missed as a Speaker. The second standard speaker of openSUSE is Axel. His talk was about SUSE Studio and GNU Health this year. 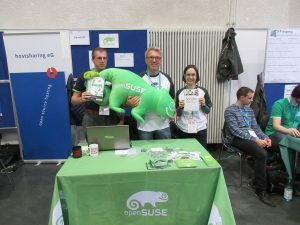 We represent openSUSE with our talks at the OpenRheinRuhr. At first all Contributors got their T-Shirts and the table should be full with marketing material. Christian and Simon were looking for our Customers during my presentation. 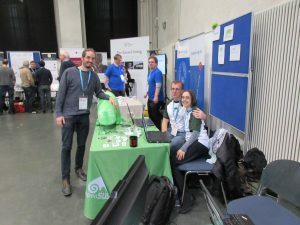 All people laughed afer hearing I would be a Working Student at ownCloud now and we want to have a cooperation booth (openSUSE / ownCloud) next year, because I want to continue with oganizing. The question with 32 bit support popped up again and the audience was happy that we have got Tumbleweed for that. 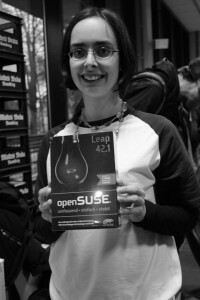 openSUSE in the Linux ranking and our plans were questions, too. Top Linux Speakers (from Germany) were in the audience. 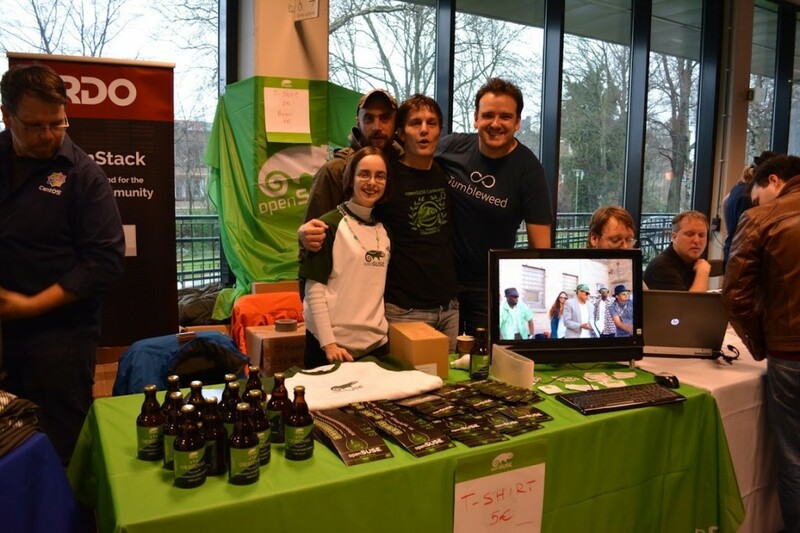 They are my new focus for marketing, because they can represent openSUSE during their presentations and are really enthusiastic. After lunch Simon asked me whether he can go to talks. I said: „Of course! You are an Advocate and should learn here, too. There aren’t better options than talks during such events for getting qualified people for the booth. I know why I look after enough people for a booth (more than 2) during conferences and expos.“ Simon smiled, told us the times and used it for learning in 2 talks. We have got new interested volunteers for openSUSE. One guy wants to join the heroes team and a woman wants to become an Advocate. Other distributions want to cooperate, too. Gentoo created pins with our logo for our fans. 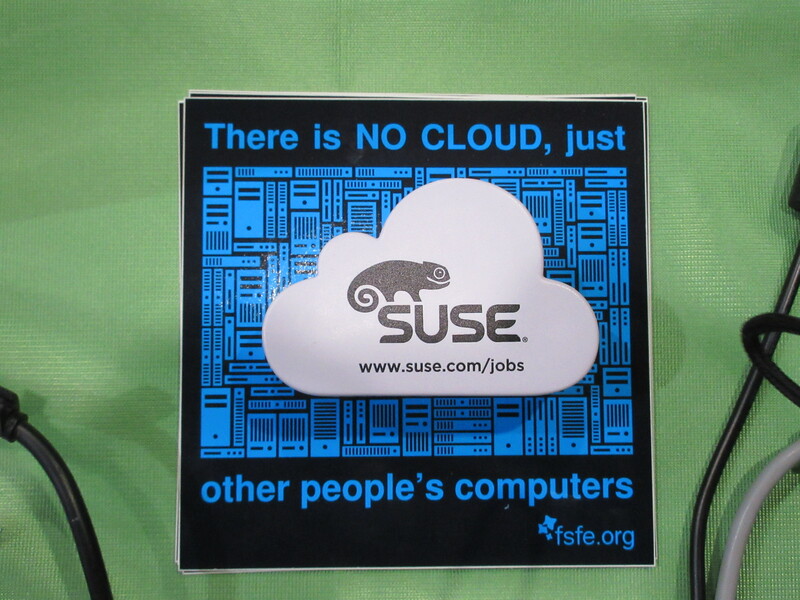 And fsfe came to us with their cloud stickers and shown us the normed SUSE cloud on their stickers. All were happy. We had a lot of fun! We had a conference party in the evening. We had so many sponsors that we were allowed to get free beer (for all) and grillables (for Contributors). Thanks to all sponsors! It was a nice evening. The ZDF (Zweites Deutsches Fernsehen) was available at the second day. They went through the hall with their camera. Self filming (with webcam) in front of the ffmpeg booth was most interesting for them. 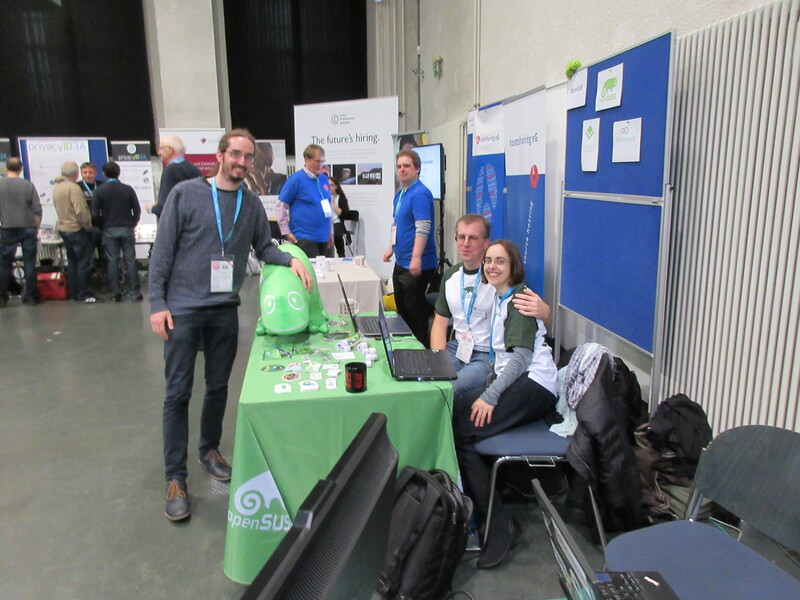 I had to give ownCloud support and the webcam security (of openSUSE) was a highlight for customers. We were asked after our release day very often and I showed my presentation slides again and again. At the end Christian and I won books (Scrum and LibreOffice) at the tombola. The talk of Axel was successfully, too. Today I left the company a little bit earlier for getting the train to Brussels. What for a surprise! A ex colleague of 1&1, who works as an architect, was sitting across from me since Mannheim. We told us about the changes in the last years, what would be new and what we want to have in the future. We had to wait for the next train in Cologne for a 3/4 hour. We used this time for eating. We met another ex colleague, who is a freelancer now. WE spoke about Cologne and the life there. I have lived 8 years of my childhood in this town. -The most important book for learning programming and algorithms in theory is Introduction to Algorithms. You can find additional videos matching to the book on the homepage of the MIT. -I go to every presentation of the Java User Group Karlsruhe. Many companies are working on the base of Clean Code. That’s the practical part for good programming. Every programmer should read this book. -You can learn operations with an own server at home or with training on the job in companies. I have taken the first way during my education as a Computer Science Expert and have got a job as a Junior Linux System Administrator at 1&1 after that. That was a big jump for me and I enjoyed my junior time. Our team has got the specialization „Monitoring & Infrastructure“. We were Sysadmins for the root monitoring system, the customer DNS and the internal DNS. I wanted to learn more and switched to an international provider for MRM systems. We are a small business, but the leader on the European market. I was responsible for all in the system administration of our customer systems. Different Open Source Software is integrated into our software and working in this area of Cloud Computing is part of Big Data. You can have fun there and grow. We took different ways after arriving Brussels. I went to the hotel Evergreen. I thought, that would be a good idea for bowing out of Evergreen in openSUSE. We‘ ll miss this project. I am looking forward to see many familiar faces at the FOSDEM. My name is Sarah Julia Kriesch and I create a new blog for you. I removed my old one, because it wasn’t very successfully. I’ll tell you about my education, the way of life and Linux.